I don’t know what I was thinking when I signed up for the Boilermaker. First, it’s a 15K. Second, it’s in July. And third, it’s in Utica, NY. I’ll tell you what part of the problem is… peer pressure. Also, it was one of those “the race is about to sell out” moments, which makes you feel like you have to have something you didn’t even care about a few seconds ago. I never took an economics course, but I think it’s one of those supply and demand deals. I was standing outside of DSW (yes, DSW) typing furiously on my phone while contending with frantic texts from my sister. My husband was giving me one of those looks, like, what the hell are you doing? but also trying to pretend like he didn’t notice. Let’s just say he was thrilled to find that I had signed us both up for a 15k race in the middle of summer. So, I’m running a 15k this weekend!!! I would love a PR, but I’m going with a more conservative race plan so we’ll just have to see how I’m feeling on race day. 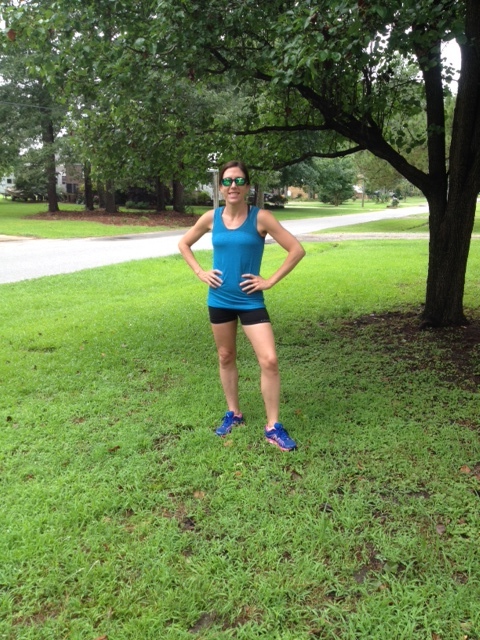 I have been testing a new pair of running sunglasses from SportRx for the past two months. I have to say, I am a big fan. I’ve always preferred Oakleys for running, and in college I wore a lucky pair of purple Oakleys in my biggest races, until they were tragically stomped on at the track one day (RIP, purple Oakleys). Luckily, with help from Rob at SportRx, I was able to find a pair that suits me. So, here’s the deal. I usually wear contacts, but my eyes get dry (especially in the summer) and sometimes I prefer glasses. Well, that doesn’t work for running, particularly in the bright summer sun (hello, July). 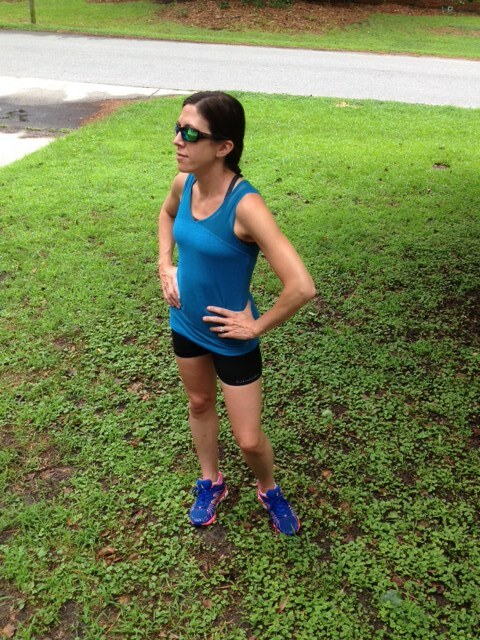 Your regular eye doctor probably doesn’t have a huge selection of stylish, comfortable running shades. This is where SportRx steps in to take the guesswork out of finding prescription eyewear. You can browse their website by sport, by brand, or by category (they have sunglasses, goggles, and regular glasses) to find the style you like best. They have a huge selection, with multiple frame colors and lense colors. The ones I am wearing are the Oakley Fives Squared in grey smoke with green polarized lenses. How do you smize while wearing sunglasses? It’s impossible. Disclaimer: SportRx gave me this product to review. Regardless, I only recommend products I use personally and believe will be good for my readers. It’s been a little over a week since I returned from my two weeks in New York with my family. 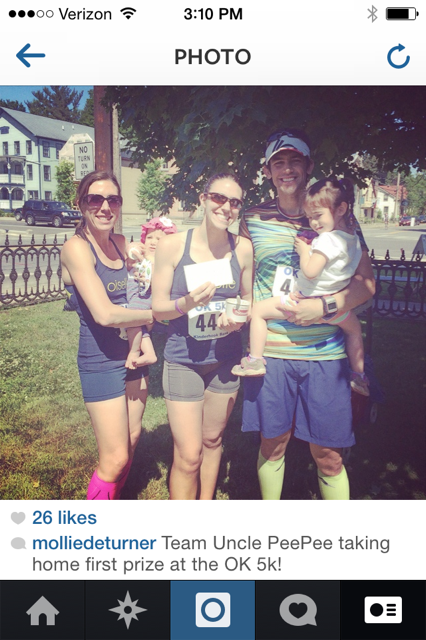 While I was there, I ran my second race since my injury, the OK 5k, in Kinderhook, NY. I have run this race several times (and still hold the course record), and it’s one of my favorites for several reasons. My dad is a sponsor, the lead vehicle is driven by a good family friend of ours, and Kinderhook is a nice historical town to race in. One of the reasons I like to run the OK 5k is the course- it’s flat, and fast, and is laid out perfectly. It starts in the center of town and you run straight down the road for one mile to the apple orchard. Then you turn left and run straight down a back road for another mile. You turn left and run straight for the third mile, and then finally left onto the main road for the last tenth of a mile. I like that you can see each of the mile markers so you know where you are in the race at all times. For this year’s race, I woke up around 6:30 and fed Emma breakfast. I unfortunately did not have time to get myself ready, but managed to brush my hair in the car and locate most of my race gear. I didn’t have time to look for my watch, and didn’t get to eat much besides half of a bagel, but we got to Kinderhook in one piece and with enough time to warm up. I wasn’t too worried about my watch because I’ve run plenty of races without one, but I was concerned that I might be dehydrated. I had only brought one bottle of water with me and it was almost empty by the time I finished my warm up. And it was unusually hot and sunny for the race this year. The gun went off at 9:00 am, and from the start I felt a little off. I found myself in a group of women somewhere around a half mile into the race, so I just relaxed and tried to stay with them until the mile marker. Fortunately there was someone reading splits at the mile, which I came through in 6:00. At that point I felt pretty good, and I always try to push the second mile of a 5k if I can, so I left the group I had been running in and started pressing forward. The race ahead of me was fairly strung out, but I was able to pass several people in that second mile and I came through two miles in 11:52. With only a mile left, I was running in no woman’s land, but I still kept pressing. I saw a woman pretty far ahead as well as a few men. I was able to pass a few more runners in the final mile, but couldn’t quite catch up to the woman ahead of me, so I settled for fourth in 18:23. So, let’s talk about feet. Mine always hurt. I can tolerate wearing shoes for about an hour, and then after that I have this urge to just take them off. After a run or a race, it’s the first thing I want to do, and I know I’m not alone. 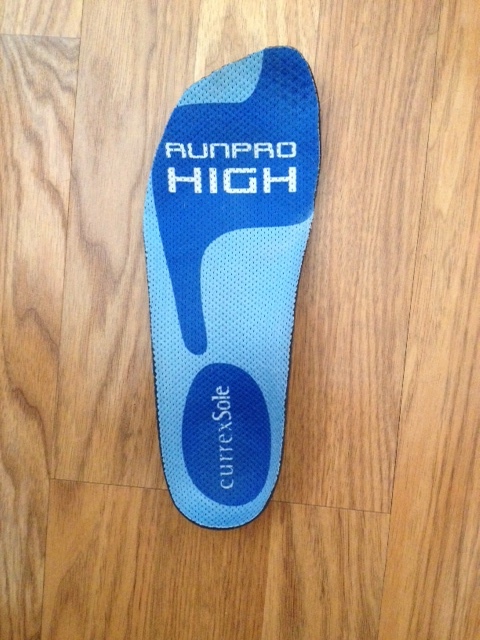 I was introduced to a new type of insole, currexSole RUNPRO insoles, a few months ago. OK, so I know you probably have the same beliefs about insoles that I previously held- they’re stiff, heavy, uncomfortable, and they’re going to leave me with blisters. Plus, I tend toward more minimal running shoes, and I was worried they would alter my stride or feel awkward. 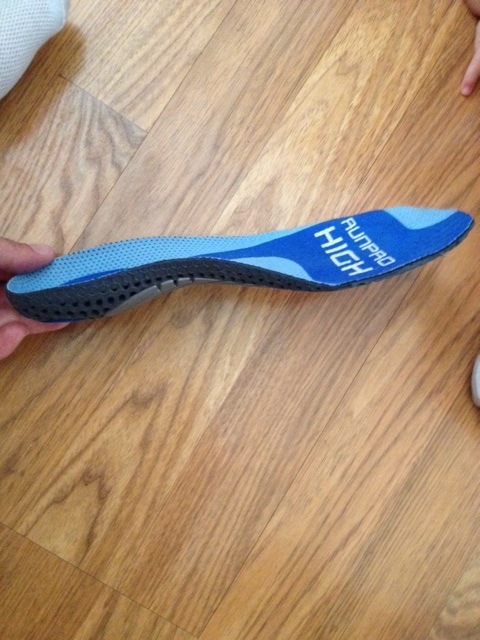 The thing is, these insoles are completely new to the United States. I was so pleasantly surprised when I started running in them at the end of April. So here’s the rundown: currexSole insoles are made in Germany, and the Europeans have a much different view on insoles. These are made to move with your feet instead of trying to force them to move in a certain way, which is exactly how all of the major shoe companies are designing their shoes to perform these days. 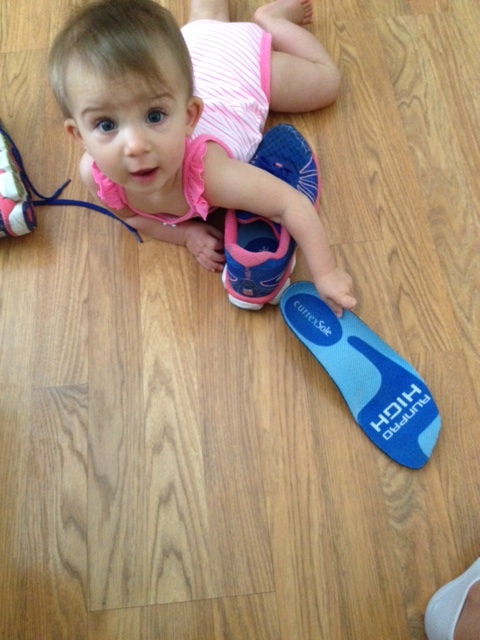 They have several different models of insoles. I run in the RUNPRO HIGH version because of my high arches (you can check out the sizing process here). I have been testing them for almost two months and I no longer have that achy feeling my feet after I run (although I do miss my nightly foot massages). My injury comeback has been very smooth, thanks in part to changing up my strength routine, adding in some cross training, and taking good care of my feet. Disclaimer: currexSole gave me this product to review. Regardless, I only recommend products I use personally and believe will be good for my readers. If there’s one thing that really frustrates a endurance athlete… that would be hydration for sure. Why? Well, there is a delicate balance between taking in enough fluids for your cells to function normally, and taking in so much so that your body rejects it. I’ve been on both ends of the woes of hydration. I’ve had two experiences with running out of fluids on a long run. The first time it happened I was only a mile and a half from home and it was a very hot day. I was extremely dehydrated and starting to feel like I might pass out, so I stopped into a restaurant called the Sunrise Cafe (which ended up being a Philipino reestaurant) and asked for water. I was wearing a sports bra and shorts, dripping with sweat and everyone was staring. The lady behind the counter gave me a cup mostly full of ice, which I immediately chugged. Twenty seconds later as I walked out the door= worst brain freeze of my life! A few months later I had a similar episode, and ended up stopping at Starbucks two miles from home. They were a little more accepting of my situation and I didn’t get as many stares. Yes, I took this picture in my classroom this afternoon. Nice backdrop, eh? So, to wrap things up (I tend to be long-winded, I know), if you are interested in trying out Nuun for yourself, check out their website. 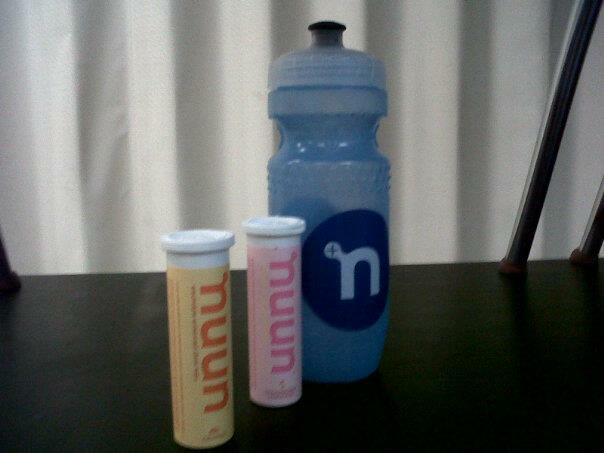 You can also follow @nuunhydration on Twitter!